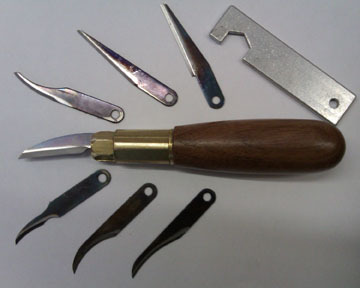 SHANKS Stick press, screw joints, wrist straps, wood oil, epoxy, compasses, leather lace etc. FERRULES AND COLLARS Metal, rubber and spike ferrules, metal & horn collars, horn spacers etc. HANDLE AND CARVING BLANKS Pre shaped in hardwood, glass eyes, epoxy, studding, starter kits etc. HORNS Horns & antlers, pre shaped handles, caps, spacers, bending jigs, embedding resin etc. STICK KITS Complete kits with everything you need in one easy-to-order package! STICKMAKING FORUM Join in with our new forum - ask questions, get answers! Page last updated December 2018 - click on "Refresh" or "Reload" to ensure you see the latest information each time you visit. See HERE for information on postal price changes. Please note - small packages will normally be sent by Royal Mail and larger ones by courier. IT IS ILLEGAL TO SELL KNIVES TO ANYONE UNDER THE AGE OF EIGHTEEN. BY PURCHASING ANY KNIFE FROM US YOU CERTIFY THAT YOU ARE AGED EIGHTEEN OR ABOVE! "RAZOR EDGE" Tools really are RAZOR SHARP !!! The knife fits comfortably in the hand for right or left hand use. (provided) with one already fitted to the handle. This is great for travelling to shows or taking anywhere for carving away from home! Handmade in the USA, the quality of these items is extremely high, with a comfortable walnut handle and seven interchangeable blades. When delivered, the general purpose Heavy Duty Blade is fitted to the handle. Loosening the locking-nut at the front (using the spanner provided) enables blades to be changed easily and safely within a few seconds. 1 Walnut Handle with brass "Lock Jaw" mechanism and locking tool. 6 Finer Blades for detail carving. All the blades are made from high-carbon tool steel, hardened to Rockwell 60 C scale, double tempered, and hollow ground (basically, that means hard steel with a sharp edge!). The kit is normally supplied in a plastic pack. 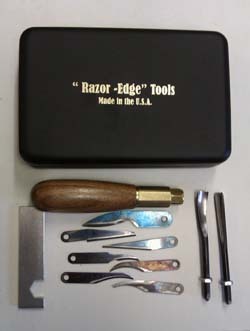 A brilliant set of seven carving blades PLUS a "V" gouge and a general purpose gouge. The addition of the two most useful gouges makes it much more versitile for stick carving than knife blades alone. The complete kit comes in a handy pocket-size case which makes it great for carrying with you and also makes the kit a superp present if you want something a bit special! Always a popular present at Xmas so don't leave it too late - last year we ran out! (About ten in stock now). 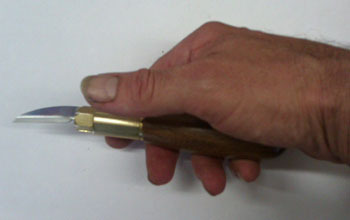 Long blade (82 mm) useful for removing large slices or use the fine point for detailed carving. Made in Sweden, simple wooden handle that is extremely comfortable to hold and use. Laminated carbon steel blade - really sharp edge! These don't have stainless blades and a small amount of surface scale may be visible. Stainless blades don't sharpen as well as carbon steel. Retractable blade - cheap knife with many uses. Double sided, coarse and fine grit. 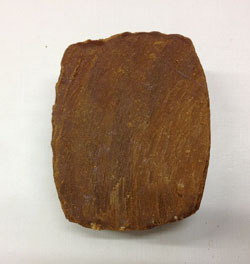 8" stone (200 mm). Best selling safety glove offering outstanding mechanical performance and a high Cut Level 5 protection at an exceptional price! I've been using these for several years and they are FAR BETTER than any other gloves I have used! Knitted from a mixture of Kevlar, Steel, Nylon, Glass Fibre and other materials to offer cost effective yet high levels of cut protection. 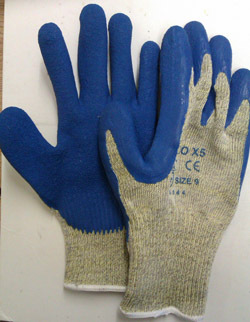 Rough Natural Latex coating provides excellent grip for the palm and finger tips and gives quite good protection from rotary carving tools as well as knives and gouges. Beware though - you can still pierce the gloves with a sharp point! Sold AS A PAIR, size 8 (small/medium). Hardened steel twist-drill bit for use with 8 mm studding. 13 mm (1/2") drill bit for drilling out 'socket' in handles and heads for 12 mm dowel or for brass screw joint. 16 mm (5/8") drill bit for drilling out 'socket' in handles and heads for peg joint and 16 mm dowel. 20 mm drill bit for drilling out hole for 20 mm compasses. 24 mm drill bit for drilling out hole for laminated pictures. 25 mm drill bit for drilling out hole for laminated pictures, badges etc. Two-part epoxy - mix equal amounts of adhesive and hardener together to start the setting reaction. The mixture sets slowly, starting off quite soft like Plasticine and slowly getting harder. In effect you have an hour or so before the mixture gets too stiff to work and it's pretty hard after three hours and can be handled after that. Colour when set is pale grey. As above but black. Useful for setting objects in plastic where you want a black background or for reparing buffalo horn. Can even be used to make spacers and caps for antler handles! Useful for setting objects in plastic where you want a white background or for repairing antler. Superfine consistency makes it easier to handle and shape than other colours. 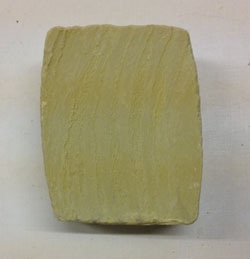 Similar to "Araldite Rapid" but much cheaper! Three to six minute working time, full strength achieved in 60 minutes. Setting times are slower in cool conditions. You should be able to glue up at least six to ten handle/shank joints with each pack. This is the only adhesive I now use for fixing heads and handles to shanks! Also good for filling hollows or cracks in horn handles - it is almost colourless. Perfect for fixing glass eyes in heads and many other uses. As above but 6 packs for just £23.40, saving £3 on normal price. 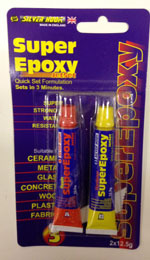 6 packs Epoxy Adhesive £11.70 (only 1.95 each). Mixing spatula for use with two-part epoxy. Clean off epoxy after use and use again and again! Longer lasting than the small one in the epoxy pack. 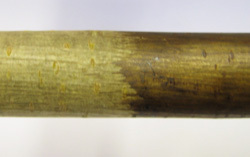 Below: Weak solution used to darken pale bark on hazel. 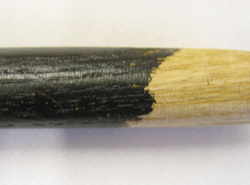 Below: Strong solution used to "ebonise" turned ash. enough to stain dozens of sticks! Used to make wood stain, add crystals to water to make stain from pale brown to almost black - the more crystals you add, the darker is the stain! Brilliant for darkening pale bark or for bringing out grain in peeled or turned shanks or for darkening pale carvings. A really strong solution will "ebonise" wood to make it look black. MIXED PACK Three pieces in each pack - approx. 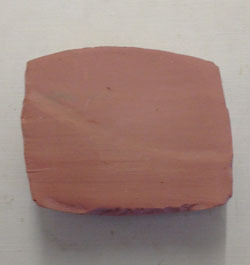 30 cm (12") X 2.5cm (1") each - one in each of three grades (coarse, medium and fine). 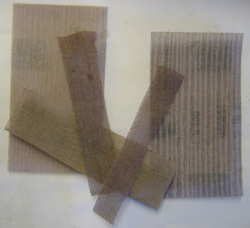 A pack contains enough tape for one or two stick projects. ALSO SOLD BY THE METRE ! 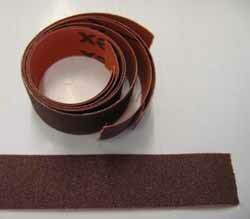 COARSE tape (80 grit) sold per metre. This was introduced to us by one of our customers and we were so impressed we immediately started stocking it! The Aluminium Oxide abrasive is presented on a fine mesh which allows the particles of wood or horn to drop through (use dust mask or dust-extraction unit where possible) so making the material clog less often. 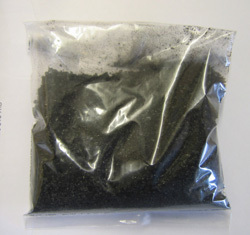 We sell it in packs of FOUR pieces of a single grit size or mixed. Each piece is 70 mm x 125 mm (approx. 3 x 5 ") and can be folded or torn into thinner strips. It works well on horn as well as wood and antler and has quickly become our favourite abrasive! 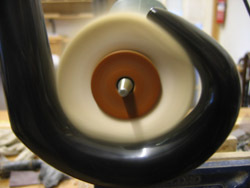 We stock the four sizes we find most useful - 120 and 180 grit are most useful for starting off and the 400 and 600 grit are great for finishing, particularly on horn where it can be difficult to remove those last scratches before polishing. If you order multiple sizes we may put them in one large pack to save packaging. PEEK polishing paste from the USA. Brilliant for use with horn, antler, plastic sheet and clear resin. Use after removing all sanding marks and scratches with the steel wool or fine Abranet. You can get a gloss equal to that obtained with our buffing wheel polishing kit below - though it will take longer! 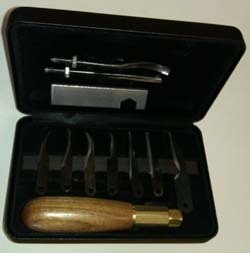 Polishing Kit for horn, antler, plastic and embedding resin. 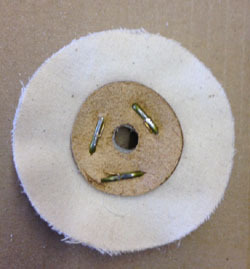 Note: The polishing kit is best used after all scratches have been removed with abrasive tape/mesh or steel wool. 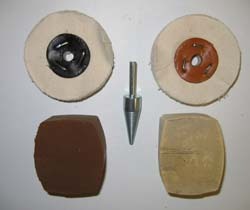 Set of two polishing wheels complete with coarse (brown) and fine (cream) polishing compounds (one for each wheel) and a threaded cone mandrel. The mandrel fits almost any electric drill (including a bench drill) converting it into a polisher! Use one wheel with coarse compound to take out fine scratches left after abrasives - then use the other wheel with fine compound to polish to a bright shine! If you want to use an extra "super fine" compound afterwards to get that really mirror-like shine then we have that as an extra below, along with replacement compounds if you run out. Gently touch rotating wheel with compound block to apply a fine coating. NB use eye protection with rotating wheels and use on fairly slow speed for best results. The wheels are small enough to fit inside most crooks and market sticks to get to those hard-to-reach internal curves. NEW Additional Block of pink Super Fine Polishing Compound to go with your wheels for that extra glossy shine! You need to have a good finish before using this or you'll be wasting your time! To go with the Super Fine compound above - turning your polishing kit into a three-stage kit. You can get away without the extra wheel but it's better to use each compound on its own wheel if you can to avoid contamination. Pack colour may vary but contents are similar. Pack of ten different coloured starter tubes, great selection for the price! For painting carved wooden or horn heads etc. Clean brushes and thin paints with water. Thinner coats dry in around 20 minutes and don't clogg up your carved detail. Best used over a sanding sealer or base coat of primer to stop paint being absorbed into the wood. 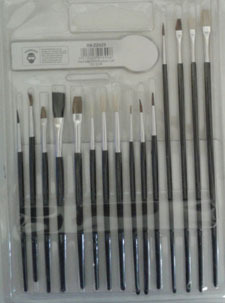 Paint Brushes Set of 15. Need Bandsaw blades? Try Tuffsaws - they're the ones I use and can recommend!